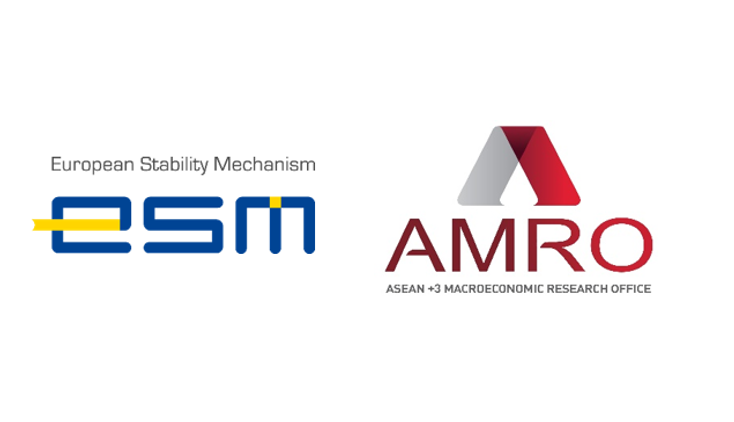 Washington DC - The ASEAN+3 Macroeconomic Research Office (AMRO) and the European Stability Mechanism (ESM) today signed a Memorandum of Understanding (MoU). The MoU provides a general framework to strengthen collaboration in matters of common interest between the two organizations. AMRO aims at contributing towards securing economic and financial stability of the ASEAN+3 economies (Brunei, Cambodia, China, Hong Kong - China, Indonesia, Japan, Korea, Lao PDR, Malaysia, Myanmar, Philippines, Singapore, Thailand, Vietnam) through conducting macroeconomic surveillance and supporting the Chiang Mai Initiative Multilateralisation (CMIM). The CMIM is a multilateral currency swap arrangement between ASEAN+3 members, established under the agreement signed by the ASEAN+3 Finance Ministers and Central Bank Governors that came into effect on 24 March 2010. The ESM is a permanent crisis resolution mechanism for the countries of the euro area, established by a multilateral treaty of the euro area Member States and which started operating on 8 October 2012. The ESM’s mission is to provide financial assistance to ESM Members in a severe crisis. Together with its temporary predecessor, the European Financial Stability Facility (EFSF), the ESM has granted rescue loans totalling €270 billion to Ireland, Portugal, Greece, Spain and Cyprus in exchange for the implementation of economic reforms. Ireland, Portugal, Spain and Cyprus have successfully exited their rescue programmes.